The brow chakra, also commonly known as the ‘third eye’ or ‘Anja’ is the sixth chakra and is sometimes referred to as our ‘sixth sense’. Located between the eyes, our third eye deals with our insight and intuition as well as our clairvoyance and dreaming. A balanced third eye allows you to perceive information on many different levels. Many people choose to open their third eye to enhance their psychic abilities, and there are several ways to do this. 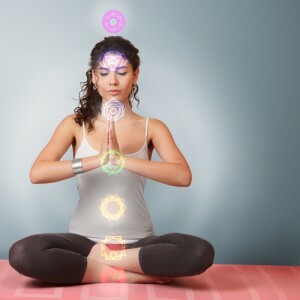 Meditation is an obvious place to start when balancing the chakras, and it is arguably the best way. Sit or lie down comfortably, clear your mind and try to focus all your energy between your eyebrows where you third eye is located – your third eye may even show itself to you without you even trying. Incorporate healing crystals into meditation to further develop this charka by simply placing a stone on your forehead and allowing its energy to flow into your third eye. The colour purple strongly resonates with the third eye, so crystals such as amethysts or purple fluorite are often popular stones to work with. When balanced, we experience high mental ability, which even enables us to receive messages from the past and future. Although the third eye is blind, it does allow us to direct our sight inwards, giving us deep insight into our unconscious minds. When we live with a balanced third eye, we experience overall good health, control over our mind and emotions, and a deeper sense of intuition. The third eye is the best way to experience different dimensions that your physical sight can’t perceive, without you having to leave your body. It is our gateway to concealed wisdom, and traditionally amongst cultures of South Asia, a red dot of colour is applied to the centre of the forehead, to represent the third eye. The ‘bindi’ is thought to retain energy and strengthen connections as well as protect the wearer against demons and bad luck. Some signs that someone is experiencing dysfunction with their third eye include feelings of confusion, indecision and the inability to see the bigger picture in life. You may feel lost and without inner guidance you can start to lose your sense of purpose or path in life. If you chose to ignore a blocked third eye chakra, it may also manifest in some physical problems. Common complaints include headaches, spinal dysfunctions, or sinus and nose congestion. Some traditions connect the third eye with the pineal gland, a small gland located in the brain. This tiny pinecone produces melatonin, a hormone that controls the internal body clock and the modulation of wake/sleep patterns. For this reason many people experience disturbed sleep, or frequent nightmares when their third eye is blocked. The third eye chakra is incredibly powerful, so when working to open it up its important to take it slowly. A sudden switch from our ordinary vision to opening the doors of the subconscious may feel a bit too much for us most of us to handle!